Somebody posed a question recently on a European travel forum that asked, "why do people talk about ‘gelato’ as if it were something other than just the Italian word for ice cream?". I pitied the poor person who asked this question, not only for obviously never having had the life-changing experience of eating a real gelato, but mostly for the frenzied wrath this question incurred among the more savvy members of the gelato-eating public. They took no mercy, filling up obscenely large amounts of comment space and veering dangerously near fanaticism in their attempts to ‘educate’ the question-poser that this is no mere linguistic distinction. The thing is that despite my distaste for most things fanatical, I found myself sympathizing more with the gelato fanatics than with the poor question-poser. Could this be a sign that I verge on some pretty extreme gelato feelings myself? I mean, of course I like ice cream. But when push comes to shove in the ice-cream vs. gelato debate, no amount of pushing, shoving or bribery can prevent me from firmly parking my allegiance on the side of the latter. However, it is a legitimate question to ask what the difference is, because ice cream and gelato in my opinion share approximately the same latitude of similarity as leberwurst and foie gras. Both are good, but it’s obvious which one you’d be smearing on your toast if given the choice. As a matter of fact, I once spent four weeks in Italy trying to pin down the elusive qualities that set true gelato in a class by itself. It required extensive and back-breaking research, let me tell you, but the conclusions I came to were thankfully more than worth the effort. Here’s what I discovered. First, gelato is served slightly warmer than ice cream, which allows it to keep its creamy, supple texture and causes it to take less time to melt and release its perfumes on the tongue. Second, gelato flavors are often mind-blowingly intense thanks to to a lower fat content – fat by nature coating the tastebuds and dulling perception of flavor – a happy fact I can confirm as I was able to plough my way through remarkable quantities of the stuff without batting an eyelid (or loosening my belt… er, too much). Third, I noticed that when gelato melts, it doesn’t flow in sticky little rivulets out of the cone and all over your hand; instead it keeps its shape remarkably well, even under the scorching heat of the midday Italian sun. And what does all this mean for the home gelato craver? Well, these observations led me to the conclusion that a good homemade gelato needs to be given the following treatment if there is any hope of approximating the original: a) it should preferably be kept in a home freezer that has had the temperature raised ever so slightly so that it doesn’t over-harden; b)it must contain only milk, no cream; c) it should contain large amounts of flavoring agents, preferably from fresh, ripe natural sources; and d) it should be comparatively thick in its unfrozen state (think pudding), thus insuring a slow and even melt. Ideally we would also have a high-end gelato machine in the equation, which through its expert coddling would freeze our base into a dense, silky and ice-free treat. I realize this may be a bit much to ask for in most households (including my own), and the turning-up the freezer part may be unrealistic as well (after all, heaven knows what balmy temperatures will do to that haunch of venison you’ve been saving for a rainy day). That is why I have tested the following gelato recipes without the use of any machine whatsoever and have frozen them in nothing but my tiny fridge-internal freezer compartment (which as a matter of fact has no separate temperature control, and god knows I wouldn’t want my milk going sour, even for the sake of gelato). The first problem confronting the prospective home gelato-maker, after she has accepted the above truths and techniques, is what flavor to make. Again, Italian gelato-veterans know that the typical choice on offer even in a modest gelateria can induce paralyzing internal debates, and the gelato giants (think Vivoli in Florence) can positively make you collapse from decision neurosis. Everyone agrees, however, that there are a few standards which must be done well, and which can be used to test the quality of any new place you encounter. In Italy the flavors I always chose to test new establishments’ credentials were pistachio (which should not be overly green AND should taste like real pistachios), lemon (should be equal parts tart, sweet and fresh), and of course my own Achilles’ heel: chocolate. Chocolate should be first and foremost deeply, darkly and dangerously chocolaty, it must not be overly sweet but at the same time not overly bitter, and it should be every bit as silky, creamy and nuanced on the tongue as an artisan chocolate truffle, but much more refreshing. Needless to say, it’s a hard flavor to master. Which is why, in order to bring to you the best possible recipe for making it, I decided to first conduct a taste test. I collected three chocolate gelato recipes from reputable sources, but not before deciding that all must conform to two criteria: namely, that they had to use only milk, no cream, and also that they must use both chocolate and cocoa powder for the most intense and complex chocolate flavor possible. The rest of the ingredients and proportions were free to vary, though as you can see all three recipes rely upon a more-or-less identical basic formula. Apparently it is within the small differences of ingredient or technique that good gelato is separated from great gelato, so here is where I paid the most attention to detail. As you can see below, one recipe used a higher proportion of bittersweet chocolate to cocoa, another used the reverse, and the third used maximum amounts of both. Two of the recipes asked me to caramelize a small portion of the sugar to give the flavor more depth. Although I had restricted myself to using only milk, in one of the recipes I substituted evaporated milk for a portion of the normal milk, wondering what effect this would have on overall flavor and creaminess. The two other things I did to insure maximum flavor were adding a pinch of salt to all three recipes, because I believe this brings out the flavor of most ice creams, and chilling the bases overnight in the refrigerator before freezing to ‘ripen’ the flavors. And the results, you ask? The results were astounding. All three recipes were so dense and creamy they put Haagen Dazs to shame. They were so chocolaty I put off publishing this post until the leftovers were gone for fear that I would be inundated with friends demanding samples. And they were so delicious I had to include the recipes for all three. But naturally, there was also a winner. Do try your hand at making one of these. They’re easier to whip up than you’d imagine, and the results will satisfy even the most hardened gelatoholic. Just don’t plan to do it when other people are around. After all, when you’re dealing with gelato this good, a little selfishness is usually justified. The method: Three containers, one spoon, no previous chocolate in system. The grainiest (and hardest-freezing) of the three, due to having the highest percentage of cocoa butter which becomes grainy and hard when frozen (yet another thing learned from Alice). The chocolate flavor from the bittersweet bar was good, but not as deep and complex as the others which contained higher percentages of cocoa. Rather resembled ice cream than gelato, but nice in its own way for being not overpoweringly chocolaty. Very difficult to scoop on day 2, however. Wow. This used a higher proportion of cocoa to chocolate, resulting in a super dense silky texture that remained even after extended freezing (cocoa keeps ice cream soft, didn’t you know?). The flavor was very deep and well-rounded, without the gritty/powdery aftertaste present in number 3. The evaporated milk, if I do say so, was a brilliant addition, adding a subtle extra-milky creaminess that complemented the chocolate perfectly; it also added a slightly caramely undertone without having to go through the hassle of actually caramelizing the sugar. Brought back memories of sweaty afternoons lounging in piazzas. This had by far the strongest chocolate flavor of all, not surprising considering it contained maximum amounts of both types of chocolate to minimum amounts of milk. Although when the first taste of this hit my mouth I thought it would be the winner, two things bothered me by the time it slid down my throat: 1) it had a gritty/powdery aftertaste; 2) it was almost TOO chocolaty, if that’s possible. It actually didn’t taste like ice cream/gelato, but rather like frozen ganache (and has the consistency to match). A couple of spoonfuls of this and I was ready to throw in the towel. If you’re looking for the knock-down drag-out ultimate in chocoalte, look no further, though apparently, for me at least, there indeed can be ‘too much of a good thing’. Additional notes: I intended to do my immersion-blender trick of blending everything up after freezing for a few hours to lessen ice-crystal formation, but it was completely unnecessary: the cocoa in these keeps the mixture wonderfully supple and apart from a quick stir I just left them alone until we were ready to eat. Beat the egg yolks with a whisk. Gradually add the 3/4 cup sugar and pinch salt. In saucepan, bring milk to a boil, remove from heat. When slightly cooled, very slowly add to the egg yolk mixture, stirring constantly and quickly, being careful not to curdle the eggs. Melt the chocolate in a double boiler and stir until smooth and silky. Pour into custard mixture and blend. Add cocoa powder and mix well. Pour this mixture into a larger saucepan, place over medium heat (do not boil) and stir until the mixture thickens slightly. In another saucepan, heat the 2 tablespoons sugar with 2 tablespoons water until a caramel is formed. Add this to the custard and blend well. (I added a little milk to this to dissolve the caramel, as I feared it would harden upon hitting the chocolate). Chill this overnight and then process in ice cream maker or freeze for 6-8 hours in a freezer-safe container. ght container and put in freezer to harden for several hours. In a dry 3-quart heavy saucepan cook 1/4 cup sugar, undisturbed, over moderate heat until it begins to melt and cook, stirring with a fork, until melted completely and deep golden brown. Remove pan from heat and dip pan briefly into a bowl of ice water to stop cooking. (Caramel will harden.) Cool pan about 5 minutes and return to heat. Add milk and cook over moderate heat, whisking, until caramel is melted. Whisk in cocoa until combined well and keep mixture warm. In a metal bowl set over a saucepan of barely simmering water (or a double boiler), melt chocolate, stirring, and remove from heat. In a bowl with an electric mixer, beat egg yolks with remaining 3/4 cup sugar and pinch salt until thick and pale. Whisk in caramel mixture and chocolate in streams, whisking until combined. Pour custard into another 3-quart heavy saucepan and cook over moderately low heat, stirring constantly, until a candy thermometer registers 140° F. Cook custard, stirring (do not let it boil) 4 minutes more and remove pan from heat. Cool custard completely and freeze in an ice-cream maker according to manufacturers instructions (or just freeze 6-8 hours until solid, stirring once or twice). ohthey look so good! hmmm could I get away with making one right now? I was wondering with recipe 2 you mean heat the milk and evaporated milk?? not cream right? This must be the best post around this year! I love it. Hi Melissa,Thank you for all of your hard work in taste testing these for us! Now I can make some since it’s been so hot here these past few days. I have some blueberry sauce in the fridge and I wonder how chocolate gelato would taste with some blueberry sauce. Hmmm. Only one way to find out right? =)Thanks again! Hi Melissa. Great post. I like that you included all three recipes – I found that really useful for comparison!And, of course, now I’m craving gelato… which isn’t a bad thing! I would call what I just read a great article. I know it took a lot of work. You are truly dedicated. Dear Melissa,I am so going to try recipe 2 the moment I get a can of condensed milk! wonderful round up! I’m surprised to see that your gelato recipes don’t include cornstarch or gelatin as a thickener. Also, note to S: evaporated milk, not condensed!Gelato recipes are very sweet as it is. The use of condensed milk would necessatate the omition of the sugar at least. Hi S – I certainly hope you like it! And yes, like McAuliflower said, do make sure it’s the unsweetened variety of canned milk, just in case there’s any confusion :)Hi McAuliflower – As a matter of fact I only ran across a couple of recipes for chocolate gelato that used cornstarch, one of which touted itself as ‘Sicilian style’ (I even googled some Italian-language recipes as an authenticity control and didn’t find any recipes containing it). Cornstarch or gelatin probably works wonders with other flavors of gelato to thicken them up, but the chocolate is so thick after the addition of all that chocolate and cocoa that any additional thickening agent is pretty unnecessary! Holy cow, you’re my hero! Gelato is hands down my favorite frozen dessert. Ever since going to Italy last summer, I’ve been searching for gelato to match. In NY, I hit up three famous places: Ciao Bella, Otto, and Il Laboratorio del Gelato. Ciao Bella has the most intense chocolate sorbet, but its gelato was more like soft ice cream. Il Laboratorio had one of the best chocolate gelatos I’ve ever tried, and their sorbet was super flavorful but icy. Otto fell in the middle.Needless to say, it’s really expensive. About $3.50 for one scoop and I don’t have an ice cream maker. Right now I’m ripening banana sherbet from Alice M’s low-fat book, but I gave up all hope of making gelato at home.I mean, Alice M’s low-fat frozen chocolate mousse (which I blogged about) is like gelato, but it’s very much like your gelato #3. Way too rich.But now I can finally make chocolate gelato. 🙂 I’d also like to make vanilla and fruit gelato, but they don’t have cocoa to prevent them from freezing solid. Any suggestions? Dear Melissa and McAuliflower,Yikes, thanks for pointing my mistake out to me. I must’ve been feeding my dulche de leche fantasies, because I did indeed pick up a can of condensed rather than evaporated milk. Well, it’s back to the store for me. Hi Jessica – So glad I could come to the rescue! I’ve had mixed results trying to make gelato myself in the past, which is why I decided to try so many different recipes. Your question about non-chocolate gelato is a good one, though unfortunately I haven’t done as much research in this area as I need to 😉 The two methods I have used in the past to combat over-hardening are a) adding some kind of alcohol to the ice cream base (but obviously this makes it not quite so kid-friendly), and b) adding a mixture of glycerine and lecithin, which is a trick I learned from experimenting with lower-sugar ice creams. I’ll hopefully find the time to experiment with other flavors sometime soon and let you know what I find out!Hi S – Maybe you were on to something there – now you have me fantasizing about dulce de leche gelato! Hi MelissaMajor gastronomic moment happening over here. Just finished licking gelato off my ice-cream machine blade ;P It is utterly divine! Love the texture. You can almost twirl it around your tongue. I used some 55% Valrhona and Valrhona cocoa powder. Much prefer this over Pierre Herme’s chocolate ice cream (I’m comparing apples and oranges, I know, but think of it in terms of showcasing the flavour of chocolate). It is a delight to have that forward dark chocolate flavour unmarred by the taste of fat, at the same time retaining that all-important, almost chewy mouthfeel. I may try using a little condensed milk next time around just to see what it does flavour-wise. CH has a supersweet tooth and this current version may just be a tad too bittersweet for him. But it’s perfect for lovers of dark chocolate! Thank you for the recipe, it’s going to be a keeper. Dear Melissa, I retract my comment about trying to add more sweetness to it. We just had some this evening after it’d been sitting in the freezer for a couple of hours and we BOTH agree that it is perfect as it is. Again, kudos to you! PH’s chocolate ice cream is a Philly ice cream, no eggs and no cream. But I’m partial to French custard bases. So your recipe is perfect. Absolutely! We’re saving it for a dinner party we’re having to night, but it has been calling out to us and has proven quite irresistible. Hi Melissa,I tried the liquor trick (about 1 1/2 tsp of 80% proof liquor per cup of cream/milk) with a sherbet recipe. While it’s scoopable, I still get little ice crystals after I blend it in a food processor. Hi Jessica – Yeah, I’ve never had luck eliminating all the ice crystals with alcohol, though it usually keeps it from freezing too hard. Sherbet would be especially tricky, I should think, since its lower fat content would lead to increased iciness. If you figure out any solution, please do let me know! Mmmm, I made this and it’s the best-tasting chocolate gelato I’ve ever had. No need to pay $3.50 for one scoop at a shop again! It did freeze harder than I’d like though, even after I added some vodka and pulsed it in a food processor. But when it’s softened in the fridge, it’s soooo rich. Thanks again! It is funny to see that a word once only used to describe ice cream in another language is now being re-appropriated by english speakers to describe the better, richer and more traditional version of ice cream. I personnaly think that the use of the term gelato is closer to a very successful marketing entreprise to differentiate similar products than a true linguistic effort to differentiate drasticly different products. After all, the ingredients used to make gelato and ice cream (at least the non-industrial version of the product) are the same: both are made of a frozen custard. In any case, such a label is extremely useful for finding the best frozen delicacies. Melissa,I’d like to make this again, and use even better cocoa powder. Do you have any tips for finding and purchasing Poulain 1848 cocoa? I have yet to locate any online…. Thanks! Miss Tenacity – Unfortunately, I haven’t been able to find any in quite a while either. I had intended to replenish my supply while in Paris in December, but despite looking high and low I couldn’t find it anywhere :(Valrhona cocoa is very good, and should be easy to obtain online if you can’t find it locally. Other good bets are Scharffenberger, Michel Cluizel, Callebaut, Cacao Barry, and Pernigotti. I tend to keep two kinds of cocoa around the house – a cheaper one for general stuff and a more expensive kind for where it really matters – like this gelato! OK…(still licking paddle)…the winning recipe…simply remarkable. Many thanks! I made your second recipe, and it was so good! I especially loved the gelato when I sprinkled a bit of fleur de sel on it. I gave #2 a shot too – wow. I posted a link to this page and recipe, hope that’s okay. Next up: pistachio gelato. made #2, and it came out delicious and creamy.i couldn’t find any evaporated milk around here (israel, you know) so i used a can condensed milk instead, and omitted the sugar. divine! thank you so much! Have you ever tried using carob in place of chocolate. Since I started my healthier diet awhile ago, I’ve been using carob (from Holy Food Imports) in place of chocolate, and it has been absolutely delicious. Wow…this was really amazing. My wife & I made this with a small variation. Prior to sticking it into the ice cream maker we added about 2/3 tsp of mint extract (I wold say 1 tsp is a better amount) and small pieces of mint truffles. This did not by any means cut the intensity of the chocolate flavor but just added a nice mint flavor with it. Chocolate mint has always been one of my favorite flavors for a cool treat (ice cream, gelatto, etc.). I think the quality of the chocolate is going to be critical here. I used some 72% chocolate, but also used some very high quality cocoa powder that I got from a friend that is a Chef. I highly recommend this recipe. FYI, as yet another long-past-the-fact comment, I’ve found a great source for organic cocoa: http://www.deansbeans.com/coffee/products/bakers_cocoa.html(cheap, cheap, cheap by the pound – compared to buying 8oz of Hershey’s at a time)And, this is to John, the last commenter – Haagen Dazs currently has a limited edition flavor called "dark chocolate mint". Haven’t tried it yet, though. Melissa,This is superb. I will try #2 substituting the chocolate with more cocoa powder, as I cannot have chocolate. I would also like to substitute the evaporated milk for milk + skim milk powder or for milk + whey protein, as the traditional Italian recipes do not use evaporated milk and do use dry milk solids (i.e., dry milk), or so they say. Do you know how the right substitution should be? Have you ever used locust bean gum as a stabilizer? 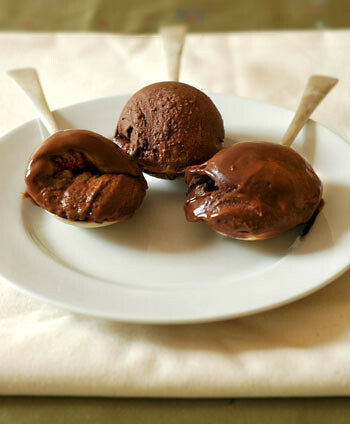 It is a natural ingredient, and it is very common in some traditional Italian gelato recipes. In Italian, it's called "farina di semi di carruba," and, apparently, is much easier to find there than in the U.S. The translation would be "carob seed gum," "carob seed flour" or "locust bean gum." It should not be confused with carob powder – they are different things. Have you ever used it, and do you know the right proportions?Thanks!